Graham Sumner has been writing and illustrating a series of articles on Hollywood Romans for 'Ancient Warfare' magazine. The sample illustration from the series (above), featuring his reconstruction of the costumes from 'THE ROBE' (1953). 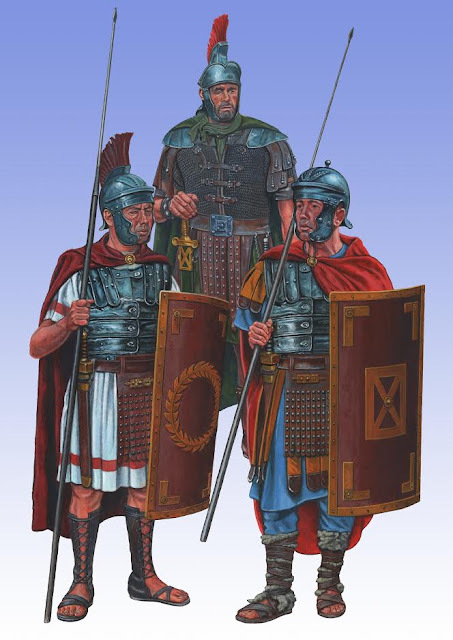 Graham, who is a fan of this blog, contacted me and asked if I could post something about his work in 'Ancient Warfare' magazine. Graham hopes to assemble all his work together and publish a book. For comparison, here's a screenshot from the film. Graham is an exceptional artist! The Robe is one of my favorite Peplums. Don't know why though, since I don't care for the religious message of the plot. I think there's a ton of great actors and performances in the film, and I guess I like the look and texture of it. He draws very well. It would be interesting to see some battle drawings. 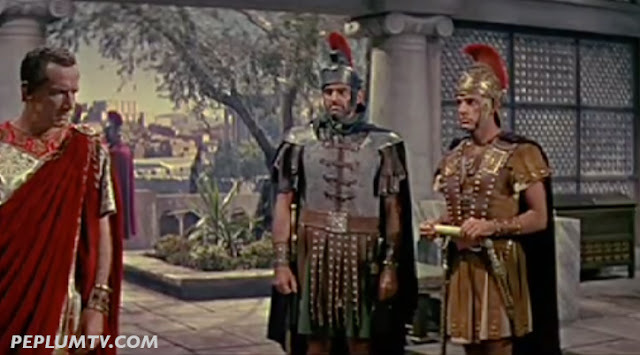 These days, here in my country, it is possible to watch movies like The Robe, Demetrius, Ben Hur, (and other movies) because Easter. Everything is good in those movies, it is incredible how those old films, even today, can change people's mood. Sorry, I have just saw the battle' drawings in the link to the magazine internet site. They are excellent! In another style, I also recommend you some comics: "The Odyssey" (Comic) 1977, No. 18 (Marvel Classic Comics, 1)1977, Marvel Classics Comics #26 "THE ILIAD" (Comic - 1977) (Vol. 1) Comic – 1977.